After the thrill and excitement of the shorter gun packages there is the ultimate 6 gun shooting experience. With this 6 gun package you get to shoot a wide range of weapons and for the really accurate marksman the chance to give Rambo a run for his money. The six guns are a Glock 17 and you get 11 bullets for this, then the Winchester Pump Action Shotgun, where 5 bullets are provided. Next is the Russian TT and 10 bullets followed by a Revolver where you have 10 bullets. The final two are the Spas 15 where you get 5 bullets and last of all, the gun everyone will have heard about, the AKA 47 where there are 6 bullets. As you would expect there is an instructor and safety equipment is provided. A bottle of Champagne is provided for the winner and while 47 bullets are a lot, there is the chance to buy more if you want to carry on for longer. Included in the price is the service of a guide, and transfers from the venue and then back to the hotel. This is an hour and a half that you will all talk about well after the wedding has been attended. Riga has several shooting ranges where customers are welcome to try their shooting skills and have the anger therapy. Although automatic guns are not allowed there the selection of guns will satisfy every needs of every tempted shooter. 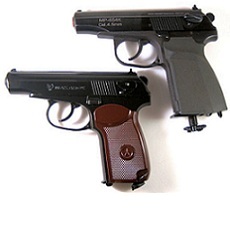 The Makarov pistol or PM is a Russian semi-automatic pistol. Under the project leadership of Nikolay Makarov, it became the standard military and police side arm of Soviet Union from 1951 to 1991. To take part in this experience you will have to be 18 years old and carry a valid ID document with you. For obvious reasons you have to be sober coming to the shooting range. Officially known in the Soviet documentation as Avtomat Kalashnikova It is also known as Kalashnikov, AK, or in Russian slang, Kalash.